Bridge Project, the liberal group, is up today with a new digital ad targeting Republican House members for their party's sputtering Obamacare replacement plan. 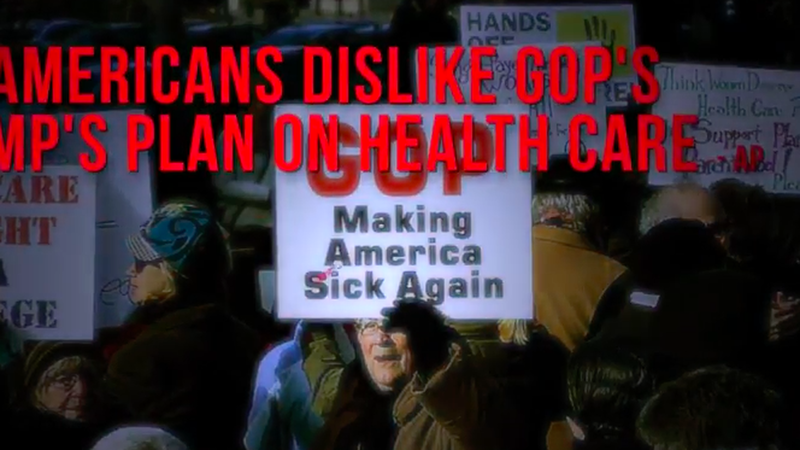 Titled "Trumpcare 2.0: Another disaster," the ad accuses these targeted Republicans — all moderate-leaning members with good reasons to fret about healthcare — of injuring working people to serve the rich. Why now? The group thinks there's a strategic window to run the ad now, with polls like this McClatchy-Marist one signaling the healthcare fiasco is costing Republicans support. Republican House members targeted: Luke Messer and Todd Rokita from Indiana; Ann Wagner from Missouri; Lou Barletta, Tom Marino and Mike Kelly of Pennsylvania; Barbara Comstock of Virginia; and Will Hurd of Texas. Why this matters: Republican members return to their districts this week expecting to face constituents who are furious about Trumpcare. A Bridge spokesman said the ad targets "Trump voters who feel Donald Trump is compromising his populist promises from the campaign — including Obama/Trump voters (individuals who approved of President Obama but at the same time voted for Trump)."